Baggett Bunch: Welcome to the world Meghan!! Welcome to the world Meghan!! Introducing Meghan Elizabeth! 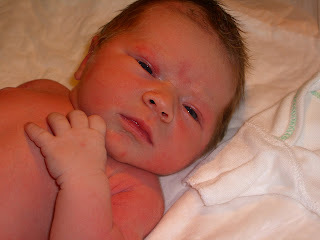 Born January 25th, 2008 at 2:28am and weighing in at 7lb 2oz, 17 1/2 inches. Mommie and baby are both doing fine. Man alive did this go fast! We were sitting around watching Chuck on tv at 9pm when Bob decided she would call the on-call nurse to see if perhaps her water had broken. Turns out her water broke about 11:30 am Thursday morning while she was walking through Home Depot. We'd already visited the hospital once for a false alarm and she at first assumed that this was again a false alarm. We checked into the hospital about 9:30pm on Thursday night. 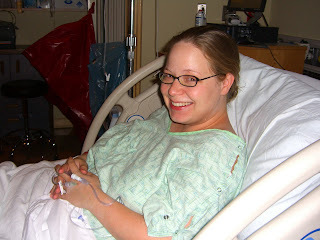 She started having her first strong contractions a few hours later and got the epidural around midnight-ish. 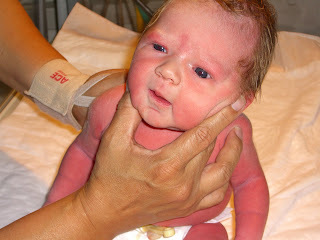 After that she felt no pain the rest of the way and little Meghan came slid out at 2:28am. Me and bob were both amazed at how quickly it all happened and really there was a relatively small amount of pain. (Of course she says that now....we'll see what kind of pain she's in in a few hours when the drugs wear off). Anyways, I'm rambling and I'm exausted (and if I'm tired I know Bobbie Jean is tired and who could blame her!!!) Time to go catch a few precious minutes of sleep while we can! Way to go! Good job Bobbie and Greg! Welcome to the world Meghan. A little advice, stay away from James. She has so much hair!!! CONGRATS!! I'm so glad it went well... and fast! Congratulations to you both! Bobbie, she is beautiful! I can't wait to hear/read all about the fun adventures you are going to have in mommy world ;-). Love to you! AGAIN CONGRATS!!!!!!! She is beautiful. Take care! She is gorgeous! Congratulations Mom and Dad! Congratulations, you two! Meghan is perfect. :) Bobbie, if you need anything during the day -- like food, or your bathroom cleaned, or someone to hold Miss Meghan while you take a real shower -- please don't hesitate to call me. :) Charyse and I are usually just hanging out, and we will gladly come over and help in any way you need. :) Just call!